Just got an OTA update on my Nexus One for Gingerbread 2.3.6. Reboot to install. Oops, what's that? Lost my root. No problem. Reboot into recovery and reinstalled su.zip. Oops, what's that again? Link2SD gave a mount warning and requested a quick reboot. After the quick reboot, the warning was gone and all linked apps were working well, but I don't relish having to reboot twice every time from now on! After some mucking around, here's how to fix it. I had to uninstall Link2SD, reinstall it, run and select the filesystem type of the second partition, then reboot. This reinstalls the mount script correctly in the new ROM and everything works fine after that. Another more powerful way of freeing up phone storage is with Link2SD. Using this method requires you to have a rooted phone. If you don't, either root your phone or there isn't really much else you can do. The idea behind Link2SD is simple. Remember Android is basically a modified version of Linux and the application files resides in /data (where '/' , or the root directory, is your phone storage). When more and more files are created in /data, your phone storage is slowly eaten up and very soon you will see the "Phone storage low" warning. Link2SD lets you move some of the files in /data to the SD storage but retain a pointer or symbolic link in /data. This is a legitimate filesystem sleight-of-hand that retains the directory structure that Android expects, but with the bulk of the data moved to the SD card. This is my personal experience with Jetstar, but it might apply to other low budget airlines as well. During the checkout process, after you enter your PayPal or credit card details and enter "Submit", if you encounter a timeout error or any other error, DO NOT TRY AGAIN! Call the airline to confirm if the order has been placed or not, or you may be left with a duplicate booking. Now if you end up with a duplicate booking, you can always call up the airline and get them to refund one of them. But the refund can take a looooonnnnng time. In my case, it took 1 month for them to approve the refund, and another week for the money to be refunded. I guess I was lucky to get my money back. Some people weren't so lucky. And did you know that 50% of Jetstar profit comes from people who buy a ticket and don't fly? I wonder what percentage of that is non-refunded duplicate booking? If you are running Android 2.2 and above, there is a simple way to free up more phone storage without rooting the device. First you need to download and install the Android SDK. Now this is not as scary as it sounds. It is actually a pretty standard installer, and it will come it handy later if you plan on doing more hacking on your Android device. The reason for installing the Android SDK is to use a command-line utility in the SDK called "adb". Next you need to download and install the USB driver for your device. If you using an Android device from one of the major manufacturers, this page should help you locate the driver. Now select "Settings" on your Android device, then "Applications", then "Development", then make sure "USB debugging" is checked. After you have done that, plug the device into the USB port on your computer and make sure all necessary drivers are properly installed. How to check "Phone storage" usage? If you are getting the "Phone storage low" warning from your Android device, the easiest way to find out how much phone storage is left and what is taking up all that space is to use DiskUsage. When you first run it, it will ask if you want to view "App Storage", or "Storage Card". Select "App Storage", and it will scan and display a simple but effective visualization of your phone storage. 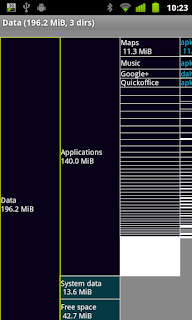 The above is a visualization of my Nexus One phone. It shows that I have 196.2MB internal storage, of which 13.6MB is taken up by system data, 140MB is taken up by applications, and I have 42.7MB free. When the free space reaches 10+MB, you will start getting "Phone storage low" warnings. Why do I get "Phone storage low" warnings on my Android device? On an Android device, there is internal storage and external storage. Internal storage is non-volatile NAND memory built into the device itself. It is also referred to as "ROM" on some spec sheets. Think of it as the "C:" drive on the PC where the Windows OS is located, and all other applications are installed. As such, not all internal storage is freely available to the user. After accounting for the system files (i.e. Windows OS), only the remainder can be used by applications. This free space is known as "Application storage" or "Phone storage". For example, the Google Nexus One has 512MB internal storage, but only 190MB phone storage. External storage is the microSD card that you plug into the device. This can be as large as 32GB on most devices.